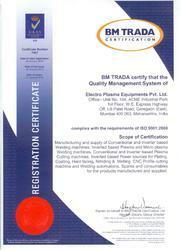 Established in the year 1989, Electro Plasma Equipments Private Limited. is one of the leading manufacturers and exporter of Inverter Arc welding machine, KS-400-MIG-MAG Inverter Welding Machines, TIG Inverter Welding Machines, Air Plasma Arc Cutting Machines, Digital Air Plasma Cutting Machines, Arc Plasma Welding Machines, Air Plasma Consumables and many more. Our range is widely appreciated for optimum performance and durability. We are a one-stop solution for all requirements in metal cutting & welding machines, accessories & consumables. Our team of diligent professionals understands client requirement and provide the effective engineered solution as well as standardized products to clients. The tolerance, efficiency, durability of our range is stringently tested by our quality controllers to ensure flawless range. Adhering to set quality norms and parameters, we assure the international quality standard of power transmission product, shaft mounted speed reducer and the ring bearing to our clients. We are headed by our mentor Mr. Mangesh S. Karnik, his strong business acumen has enabled us in established a enviable reputation in the industry. He looks after entire work of the company for continuous growth and success. We have established a sophisticated manufacturing unit, which is spread over an area of 2500 square feet. Our production is well equipped with high-end machines that enable us to meet to fabricate metal cutting & welding machines as per international quality standard. Each machine is regularly cleaned and lubricated by our professional to ensure smooth production. Moreover, our modern tool room and in-house designing unit help us to design our range in more precise manner. We will be the leader in supplying the finest quality welding and cutting products. In-order to accomplish this, we will continue our emphasis on being the industry's lowest cost producer, on providing applications expertise and solutions for our customers, and on developing new and innovative technology that responds to customer needs with value-added products and services. Expertise: We will be differentiated from our competitors by technology, quality, applications engineering, sales and marketing expertise. Global: We will have cost competitive manufacturing facilities located worldwide, where appropriate, to best serve our customers' needs. Principles: We will base our human resources systems on our proven principles reflective of our core values and our commitment to attract, reward, develop and motivate high quality people. They will reflect the global scope of our business while demonstrating responsibility and flexibility with respect to cultural diversity, and statutory and regional business realities. Responsibility: We will continually strive to be environmentally responsible and support the communities where we operate and the industries in which we participate. Our professionals are highly knowledgeable and efficiently comprehend client’s specifics requirements. We have engineers and technicians who handle the entire production process in an appropriate manner. Our quality analysts check the entire range on well defined quality parameters to ensure defect free metal cutting & welding machines. We have research associates who conduct market survey in order to improve the quality of our product range. The sincere effort of our sales and marketing personnel has helped us in catering our range to our esteemed clients. We have a modern R&D unit, which is dedicated to extensive research and development activities. This R&D section is manned by experts R&D personnel who are engaged in rigorous research activities. Over the years, they have helped us in reaching the height of success by offering efficacious and technologically metal cutting & welding machines to our valued clients. Our R&D personnel work in close proximity with engineers on the latest market developments & trends and proceed accordingly for the developmental works of the entire range of power transmission product, shaft mounted speed reducer and ring bearing. They proficiently utilize the necessary facilities made available at this section and provide their valuable suggestions to the engineers and designers, which enable them to manufacture, only improved quality metal cutting & welding machines. Further, they periodically review production technology that results in achieving economies of scale and staying ahead of our competitors. There are probably 100 reasons why Electro Plasma is a good fit for your plasma solutions but we've condensed all the points into an easily digestible list. Electro Plasma has been serving our clients since 1989. That makes us older than 95% of all plasma cutting providers out there. And we have never changed hands. Still under management of our original founders and owners. We are here to stay!